Fin Press Line includes Fin Die and Fin Press , This die consists of a drawing unit, pierce extrude, reflare, edge trim, slit, dual feed (fixed and movable), and cutoff station. The fin surface is accomplished in the last draw station by removable plate, The die stays in the press during plate changes. The die further features the latest version of draw station adjustment. Each station can be individual adjusted using a dial adjustment gauge. The draw dials are calibrated, as is the reflare adjustment dial. Our digital position indicator design will be included on all draw and reflare dials, which greatly improves the visibility and ease of adjustment. These features allow for extremely fast changes from one collar height setting to another. We also will furnish ball bushings in the main die set as serviceable pillar style bearings. Air is used in the pierce extrude station to clear slugs and scrub the walls of the extrude bushings. Air is also used in the edge trim station to eject scrap. PIERCE PUNCH LUBRICATION SYSTEM We provide the piece punch lubrication system to extra protect the punches and dies. This features a reservoir and necessary plumping to induce air and lubricant through the pierce punches automatically. This will assist to remove the round pierced Slug plus lubricate the punch during entry and withdraw from the pierce dies. This is especially necessary when running any type of evaporative fin stock lubricant. QUICK DIE CHANGE Our fin line is designed and manufactured for rapid die exchange. One man with two hours will be enough for skilled operator. Nearly all changes are of a fixed position nature to virtually eliminate adjusting things to get the dies running with the line. SEPARATE SLIT ADJUSTMENT A set of slit design upper blades can be positioned from 1,2,3,4,5,6,7,8 and more ........... row production. SPEICAL TOOL STEEL (TOOLING) The die will be designed in tooling items named ASP30, for example, Punches, Die inserts, Slitter blades and other blades. 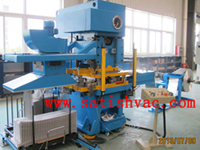 FIN PRESS The Satis 45/60 ton, [C" Frame SFL Press is specifically designed for manufacturing heat transfer fins. The press utilizes an anti-friction bearing design that reduces the required running clearances. This precision is very important for high precision achievement. A programmable controller is used to control the press. Vibration isolator machine mounts (4) pcs. are included which eliminate the need for special foundations. Automatic lubrication is provide which can lubricate every key bearings, Guide ways and so on. STOCK FAULT SENSOR This is a photo sensor system that will detect both end of stock at the uncoiler and tight stock between the uncoiler and the lube tank. STOCK LUBRICATOR We propose to furnish a tank dip type lubricator. The stock passes through the lubricant guided by rolls. Prior to leaving the tank, the stock passes through two stripping rolls which wipe excess lubricant back into the tank. The low level shut-off is quoted to protect the die in the event the stock lubricant runs out. LUBRICATION LOW LEVEL SHUT OFF & WARNING SYSTEM A low level detector will stop the press if fin stock lubricant is below a preset level. LUBRICATOR AND STOCK GUIDE SUPPORTS This is a weldment bracket to support the fin stock guide plus the fin lubricator. UPPER SUCTION UNIT AND SUCTION PLATE The current standard upper suction unit consists of a fan driven by power. The suction capacity is adjustable via transducer. Higher capacity units and variable speed drives can be designed upon request. Optional double blower units are also available for extreme material and part design conditions and 36" long fin. FIN STACKER, 2 POSITION SHUTTLE We would propose the suction drop to rod type fin stacker as 2 position shuttle (trolley) design . Using a counter on the press, the press will stop when a predetermined amount of fins have been countered out by the press. SINGLE ROW FIN OPTION Single row fins is an option for your high efficient manufacturing purpose. A fin blow down unit is used to assist to push the fins away from the suction drop. It is important with enhanced fin configurations which are very light and tend to not release from the suction drop properly. TESTING MATERIALS In order to provide convenience for customers, Supplier can buy some testing material on behalf of customer in China Please contact us if you need any more detailed information. Looking for ideal Fin Press Line Manufacturer & supplier ? We have a wide selection at great prices to help you get creative. All the Fin Press Lines are quality guaranteed. We are China Origin Factory of Fin Press. If you have any question, please feel free to contact us.